Hi everyone! WooHoo! TGIF! I'm definitely ready for the weekend to start. Work has really worn me out this entire week, am I the only one who just wants to veg out when they come home? Anyways, I'm back with swatches from the entire Sally Hansen Fuzzy Coat collection! It took a bit longer than I anticipated, but I finally had time to post about this awesome collection. As I mentioned in my press release post, this collection is pretty similar to the Nails Inc Feathered Collection and the new China Glaze On the Horizon collection, pretty much dupes I would say. 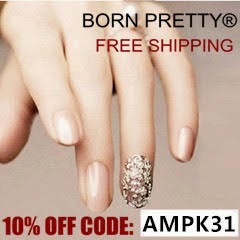 All the polishes come in a clear base with different shades of very fine bar glitter. 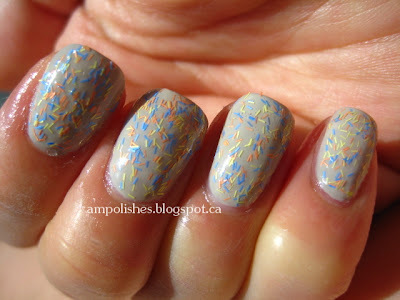 Click to read more and see some swatches! Wool Lite is a mix of light pink and white bar glitters in a clear base. When I applied it on the nail the bar glitter definitely looked more white. I used Julep Oxygen Treament as a base colour and one layer of Wool Lite, I really liked this combo because the felt the bar glitter was subtle and not too in your face looking. All Yarned Up is a mix of blue, yellow and orange bar glitters in a clear base. I really liked the pastel shades of the colours and thought it looked like a nice mix in the bottle. I used OPI Skulls and Glossbones for a base and one layer of All Yarned Up. Maybe it was the base colour I used that threw me off but on the nail, the colour combo of the pastel bars didn't really do it for me. Peach Fuzz is an orange and yellow bar glitter mix in a clear base. I used Essie A Crewed Interest as my base colour and one layer of Peach Fuzz. This colour come really screams summer to me. I love how bright and cheery it looks! 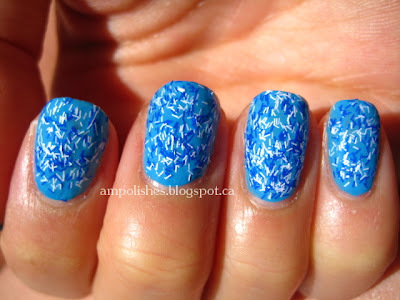 Tight Knit is a mix of royal blue and white bar glitters in a clear base. It is a close dupe to Nails Inc Cornwall in that the colour palette is relatively the same (unfortunately I do not own Cornwall so I am unable to provide a comparison). I used OPI No Room for the Blues as my base and one layer of Tight Knit. Fuzz Sea, my absolute favourite from the bunch! 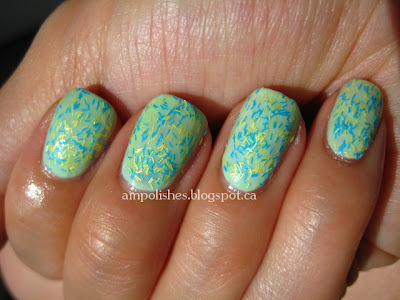 It is a mix of a blue/green aqua and yellow bar glitters in a clear base. I used OPI Gargantuan Green Grape as a base and one layer of Fuzz Sea. I really loved the colours in this one, they're bright, they're cheerful and feels very spring like to me. I thought Fuzz Fantasy is the green version of Wool Lite. It is a mixture of light green and white bar glitters, on the nail the its hard to see both colours at first glance. The light green almost looks white on the nail, it's not a very obvious shade. I used Fingerpaints Tiffany Imposter as a base and one layer of Fuzz Fantasy. Wool Knot is a bright blue and white bar glitter mix in a clear base. I used Essie Who Is the Boss as my base shade and one layer of Wool Knot. I thought this mix had a very nautical feel, blue and white reminded me of the sea and ocean! Tweedy is a black and white bar glitter mix in a clear base. What is a collection without the classic black and white mix. It's not the most original combo but it's definitely interesting to look at in this glitter format. I used China Glaze Light as Air as my base colour and one layer of Tweedy. Overall, I thought that the consistency of the polish was a bit on the gloopy side but the glitter payout was excellent. These polishes are packed with bar glitter but they were a tad tricky to apply evenly. I had to dab the brush on my nail rather than stroke the brush. You can get the polish opaque with 3-4 layers if you want but I liked the look of these polishes as a top coat. They do dry slightly gritty so topcoat is needed if you're finicky like I am about texture. Have any of you picked up any of the Fuzzy Coats yet? Any standouts from the collection? I have Wool-lite and and Fuzz-fantasy. I really like them! I've only worn Wool-lite thus far but the formula was good, went on smoothly. I just wish it didn't take 3 coats to get the full fuzz effect.